MLB Pipeline is gearing up for their pre-season Top 100 prospect list that will come out later this offseason. As a run up to that list, though, Jim Callis and Jonathan Mayo publish top 10 lists for each position. They kicked things off yesterday in the evening by publishing the Top 10 right-handed pitching prospects list. 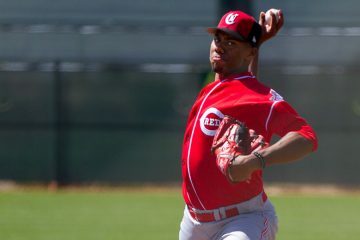 The Cincinnati Reds had one representative on the list – Hunter Greene. The Houston Astros Forrest Whitley tops the list. 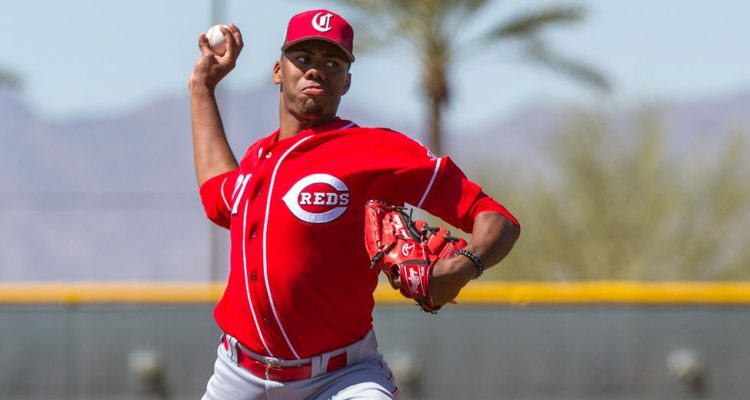 Cincinnati’s top pitching prospect, Hunter Greene, comes in as the tenth best prospect. He was tied with Michael Kopech, of the White Sox, for best fastball. Both pitchers routinely hit 100 MPH as starters and get a grade of 80 on the pitch. After a tough start to the season for Hunter Greene, he made some adjustments and dominated over the final 2.5 months of his season. From May 12th through July 26th he posted a 2.91 ERA in 58.2 innings pitched. He allowed just 45 hits, 4 home runs, 13 walks, and he struck out 71 batters. But that’s where his season came to an end as he suffered a sprained UCL. A sprained UCL means that his UCL is torn. That usually means that Tommy John surgery is going to be the next thing for a player. 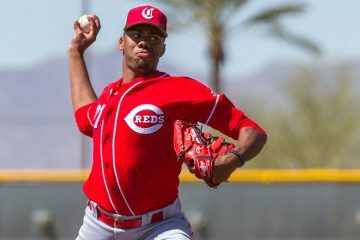 But Hunter Greene opted to go with the rehab route that pitchers Michael Lorenzen and Anthony DeSclafani also had success with. Near the end of October, Greene announced that his elbow was 100% and that he was feeling great. A little more than a month ago he returned to throwing and has no restrictions as he prepares for the 2019 season. Mark your calendars. 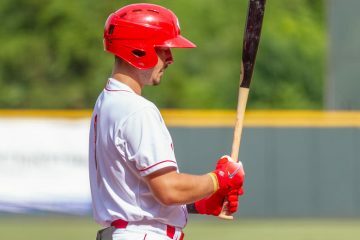 Or just keep checking back here, as I’ll publish updates if and when Cincinnati Reds prospects crack any of the lists. Should the Reds acquire another starter? 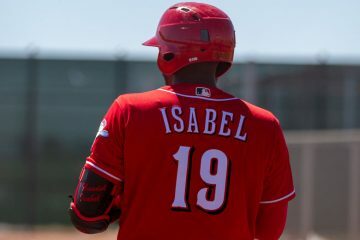 Should be in Reds SP rotation by mid 2021 if no further injuries. Maybe another Gary Nolan or Don Gullett. Hope not, hopefully Hunter will have a LONG successful career, rather than a short one. Nolan pitched 1 year in MiLB and 10 years with Reds. Traded to LAA. Gullett pitched 1 year in MiLB and 7 years with Reds. Left as FA to NYY. So far Greene has pitched 2 years in MiLB. He trails both at this point. Nolan, Gullett and I’ll add Simpson are poster boys for how you do not handle young pitchers. Facts: Nolan started at 18 as a hard thrower and quickly became the ace of the staff. He had 9.5 with Reds and 4 times he was not healthy enough to throw over 150 innings. One of those he threw 10. During the Big Red Machine era he averaged just 11.4 wins a year. He went from a fastball pitcher to a change-up pitcher and was out of the big leagues at age 29. Gullett had 7 years with Reds 9 total and was out of baseball by age 27.His completely overhead arm slot, which caused his torn rotator cuff might have been changed to a healthier slot with a little more minor league preparation. Simpson had 1/2 season of mlb effectiveness, but 400 innings of pitching in 18 months made his shoulder hamburger. He tried until 29 but was ineffective. I think for $7 million up front the Reds are hoping for a little more from Hunter and that begins by protecting him and teaching him now. Care to offer guesses at the rest of the lists for the Reds? It seems like we’ll have Stephenson in the Catcher group, Trammel in the OF group, and who knows where Senzel will show up but maybe 2B? Do you think Long will break a top 10? I think you pretty much covered it. Not sure if Long will make it or not. I’m not familiar enough with the 2B spot around all of baseball to know. Stephenson might be borderline behind the plate. Wouldn’t surprise me if he makes it, but wouldn’t surprise me if he just misses, too. India probably makes it at 3B. Don’t think we’ll see anyone else. How far down would Tony Sant. be? Probably in the 20’s or 30’s. #10. I told you he was a bust Doug! A bit premature to say that. I’m pretty sure that was sarcasm from Mike. Not a surprise. He is also one of the riskiest. If there is such a thing as Tommy John insurance then I would imagine that he has maximum coverage. Unfortunately I’m waiting for the Tj surgery news on Greene.Just hope i’m wrong. Have you heard definitively that he tore the ligament?? Just the fact that it’s reported as a “sprain” doesn’t mean a tear. It was a tear. And a decently significant one at that (in terms of ones that could and was rehabbed). A sprain is a partial tear. I like the new menu color. Reds have nobody in 10 ten lefties but the Padres have four.